Thanks to Marnee, The Baron's mom, I've been coating chicken with potato chips more often. She first introduced me to sour cream and onion chips. Now, I've moved on to BBQ chips. We really liked this and I found after prepping the chicken with the coating, they freeze really well. Doing so makes it easy to pull however many chicken strips I need and bake right from frozen [in a preheated 375 degree oven for 15-20 minutes or until cooked through.] 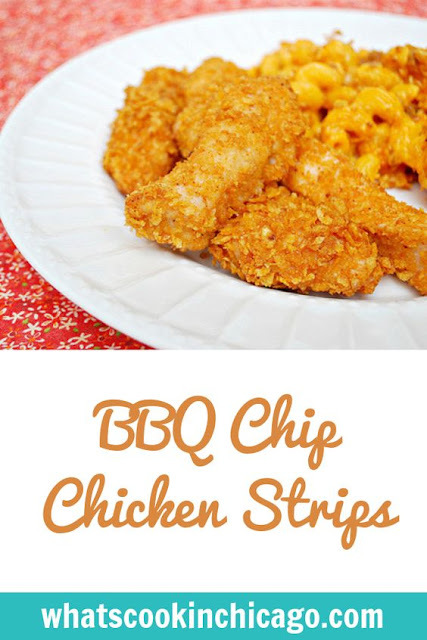 So here's a great recipe to use up those leftover chips you may have after your summer picnics! Put chicken breasts in a shallow pan and season with salt, pepper and garlic powder. Whisk egg and water together in another shallow pan. Combine potato chips and melted butter in a gallon sized storage bag. Dip seasoned chicken in egg wash and then place in storage bag with potato chips. Seal bag and shake to coat the chicken. 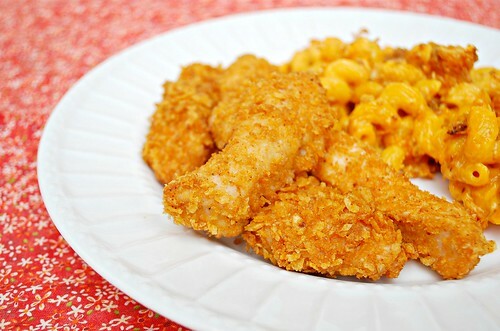 Transfer coated chicken to a baking pan and repeat with all chicken strips. That sounds like a neat way to get crunchy (aka fried) bbq chicken. Sounds yummo! What a brilliant alternative to flour and breadcrumbs! Using flavored potato chips! Love that! I have to try it! sounds delicious and perfect for my gluten free husband! BBQ chips oven sneak in barley/malt so we have to be extra careful, but these sound so delicious! Yum! I have heard of using chips to crumb chicken, but it never even occurred to me to use a flavored kind!! That soundsnlikena nice combination, my kids would love this! oohhhhh I totally just added these to next week's menu!